I’ve been doing my share of the dishes most days. Today was a truly ‘lazy’ day. 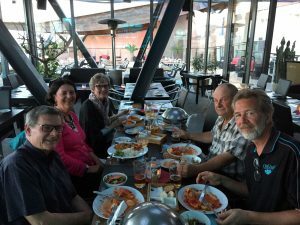 The only thing on the agenda today was a dinner in Lagos with some friends of Dave and Marylou. So I slept in until around 8:30. I got up and made coffee and we had breakfast. After breakfast we all sat around for much of the morning. I went out into town just before noon, looking for a souvenir t-shirt. None to be found. Maybe I’ll try again on the weekend — there may be a few more ‘beach’ shops opening up this weekend. I had lunch and fished out another page from the stash of Winnipeg Free Press crossword puzzle pages and started working on a sudoku. Dave and Marylou went for a little drive out to where we’d seen a whole bunch of storks sitting up in their nests on the top of tall poles. They returned shortly before 3pm and Marylou immediately set out on a hike across our ‘mountain’, heading to Lagos where we were scheduled to meet Wilf and Karen, Winnipeg friends of the Driedgers who happen to be here for the next week or so. Marylou wanted to get a head start on the walk, so that she’d arrive at the meeting point around the same time as Dave and I, who apparently walk too fast for her. 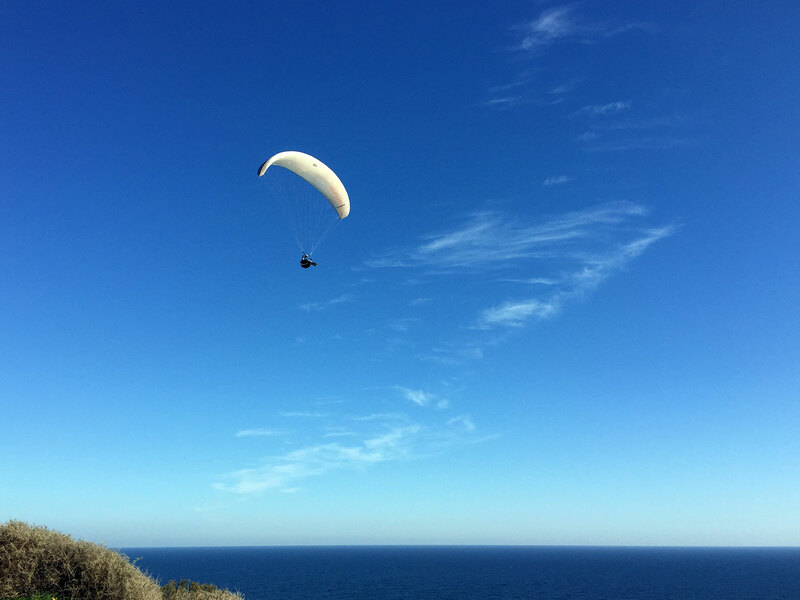 As we walked along the cliffs today, we spotted a couple of hang-gliders hovering over the coastline, catching the updraft and then flying back and forth above us. We caught up to Marylou when she was just down from the cliffs, and making the big climb up the sidewalk into Lagos. Cataplana dinner at the fish market in Lagos. We met Wilf and Karen at the bridge and were just walking back together along the main road in Lagos when we passed by a restaurant that had a menu that interested us. 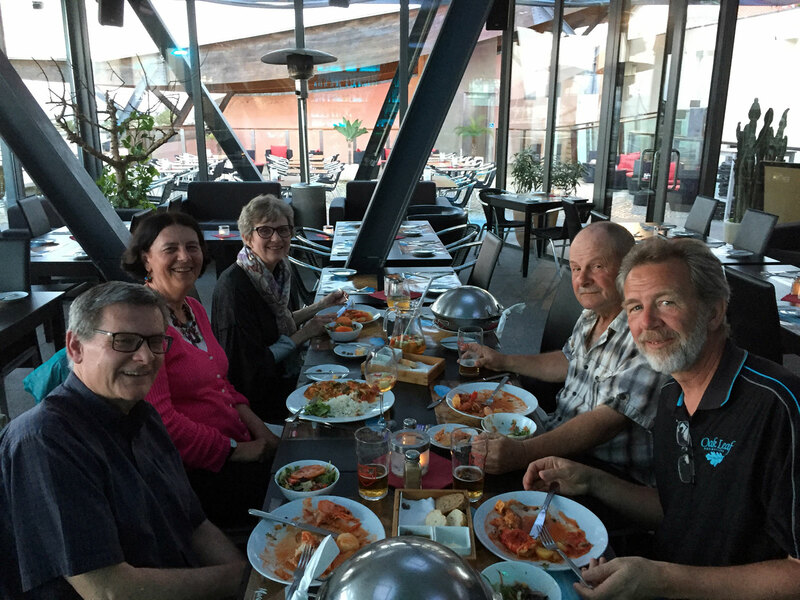 Dave had been waiting to try the Portuguese specialty dish, ‘cataplana’, so that’s what we ordered. Cataplana is a popular traditional seafood dish here in the Algarve. Fish and seafood, like prawns and clams, are cooked in a copper cooking pot called a Cataplana. And it was quite good, too! We said goodbye to Wilf and Karen — they are staying at a B&B in Lagos — and caught the hourly bus back to our place in Luz. Dave found the channel that was playing the snooker championships from Scotland, and we had our evening glass of port. We were in bed before 11. 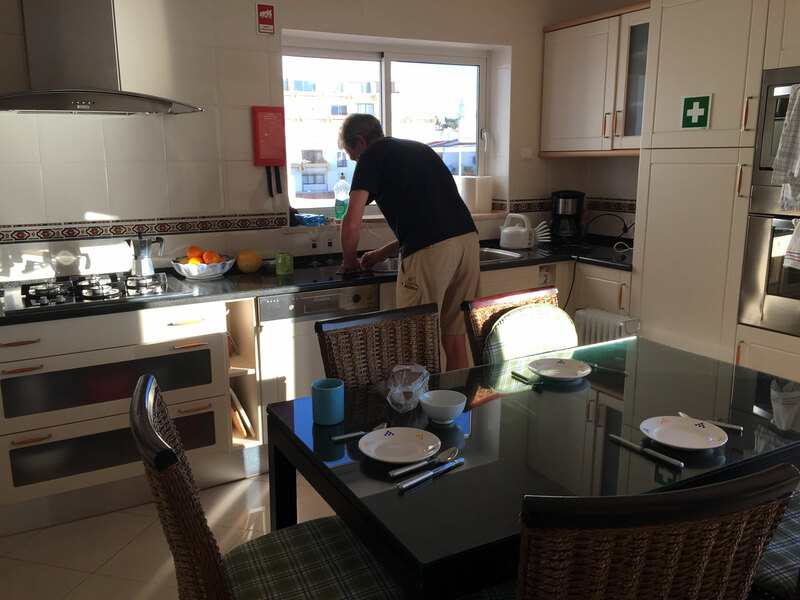 Tomorrow is another golf game for Dave and me at the Santo Antonio course.